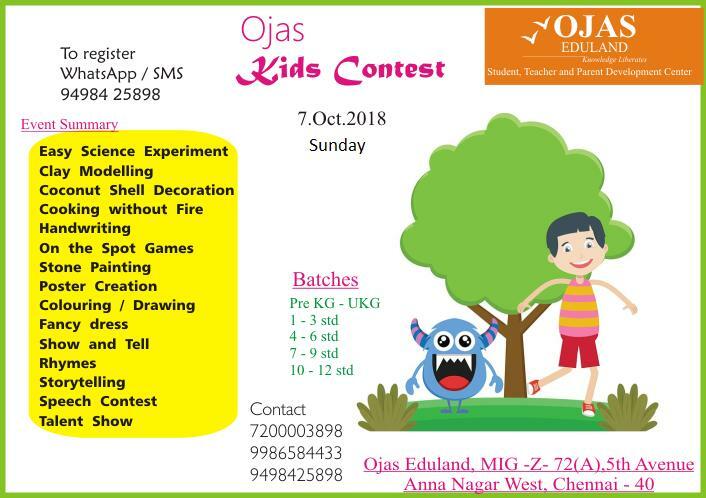 “Ojas Eduland” conducts Kid’s Competition on 7th Oct 2018, Sunday. Participants have to bring coconut shell and decorate it with paint or ribbons or stickers. Participants should use ONLY QUARTER size chart for creating posters. Finally participants have to explain what is displayed in the poster. Printed picture will be provided for Pre.K.G to 3rd students for colouring. Quarter size plain chart will be provided to 4th to 12th std students for drawing.